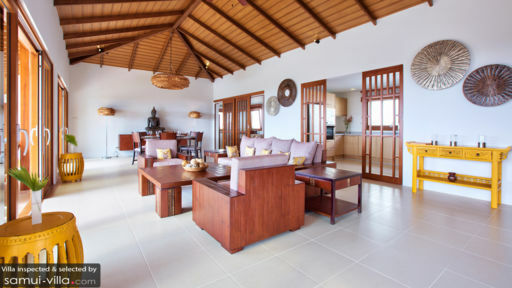 Offering a mix of both traditional Thai and modern elements, Baan Apsara is a beautiful holiday home in Koh Samui overlooking the scenic views across the Gulf of Thailand and Koh Phangan. 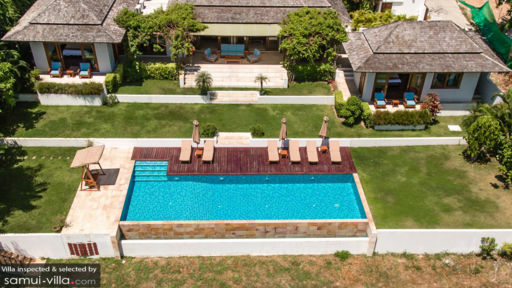 The stunning three-bedroom villa houses up to eight guests, features open-plan living spaces and terrace lounge to enjoy resplendent and panoramic scenery, and offers access to a personal 15-metre swimming pool for the most refreshing time. Nearby places include the hip neighbourhood and market of Choeng Man and beaches like Secret beach with pristine white sand shores and spectacular sunsets. Three bedrooms at Baan Apsara are found upstairs with a private terrace offering splendid views right from your balcony. While two bedrooms are fitted with double beds, one of the bedrooms has twin beds and you can even request for additional beds to accommodate up to eight people in the villa. Each bedroom comes with its own en-suite bathroom for convenience and two of the bedrooms are even interconnected making them ideal for families travelling with children. Baan Apsara offers mesmerising views right from the terrace so you don’t have to wake up and travel miles to see a sunset. The 15-metre infinity pool itself serves as a spectacular vantage point to enjoy the beautiful skies, dazzling ocean, and mountains in the background. Nature’s splendour is abundant in this part of the island and from the villa’s comfortable terrace that has been furnished perfectly well with cosy couches and lazy chairs, you can enjoy that all day, every day. Sunbathe on the sun chairs or enjoy a decadent breakfast alfresco while also relishing the view to make for the perfect morning. Housed under a traditional, wooden Thai ceiling designed with a hip roof and exposed wooden beams, the massive living space at Baan Apsara is not only well-lit with sunlight and but airy and breezy at the same time. The décor is kept light and to a minimum with some antique pieces and vintage furniture to accentuate the traditional side of the area. There are comfortable sofas and chairs for lounging and resting so you can ease into this new space without any trouble. A circular dining table stands in the corner of the room with seating for up to six guests for many feasts, cherished memories, and conversations over delicious food and some wine. Traditional sliding doors lead to the well-fitted and fully-equipped modern kitchen complete with a microwave/oven, refrigerator, granite countertops, etc. There is a media room with a large flat-screen TV and comfy couches for movie marathons late into the night. There are plenty of amenities and services on offer at Baan Apsara including a daily housekeeping, satellite TV, a personal chef (upon request), and security. Guests can even request for a BBQ for the perfect afternoon. 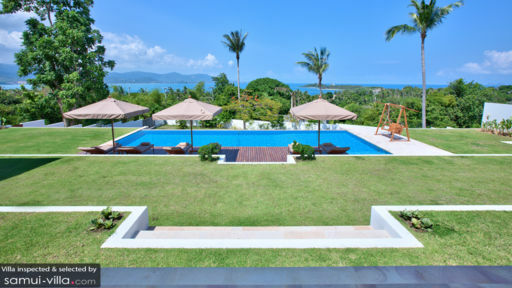 An ideal location on Koh Samui wins Baan Apsara all the stars as it is not only close to the more popular areas like Choeng Mon with its market or Secret Beach for its serene ambiance, it also gives you panoramas unlike any other location. There are many activities you can engage in, especially for kids, such as mini-golf, go-kart, and football.